Miami Herald interviews Suzanne Hollander, real estate commentator, attorney, broker and blogger in,”Will Tiny Apartments without Parking Solve Miami’s Rent Crunch.” Scroll down, read Suzanne’s interview in Yellow to learn how tiny apartments, micro units, provide “tiny” solutions to big urban problems, and, the opportunity live in the most expensive urban real estate cities at micro prices! To learn more about real estate – building, buying or selling contact Suzanne Hollander she is licensed to sell property in Florida and Maryland. To learn more about real estate – building, buying or selling contact Suzanne Hollander she is licensed to sell property in Florida and Maryland. 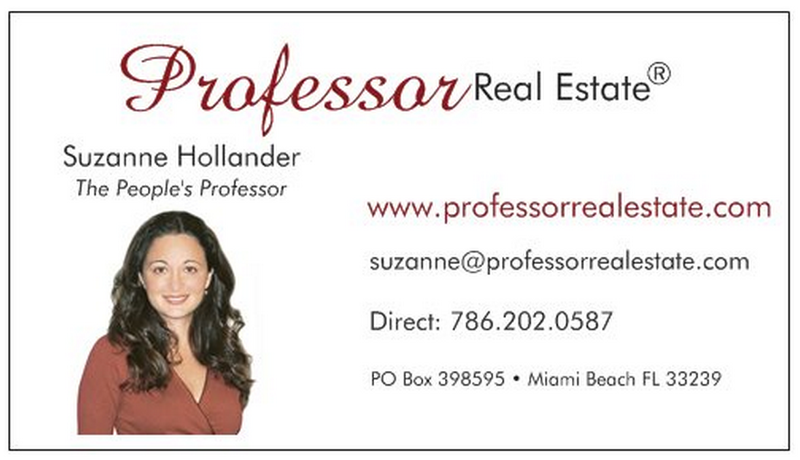 Professor Real Estate® Suzanne Hollander is a real estate commentator, attorney, broker, blogger, educator and voice for real estate housing and property rights, frequently interviewed and quoted by the media,including the Wall Street Journal Money Watch, Yahoo!Finance, Miami Herald, El Nuevel Herald, The Palm Beach Post, The Real Deal, Mercado de Dinero USA, Scotsman Guide Commercial Real Estate Edition, The Capital Gazette Newspaper and National Wallet Hub.